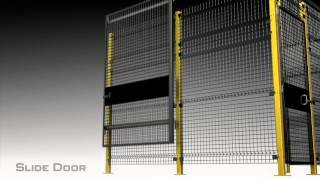 Husky Rack & Wire is one of the largest material handling products manufacturer in the United States. We are an industry leader in providing the highest quality Pallet Rack, Cable Reel Rack, Wire Deck, Velox Machine Guarding, Security Partition, Aisle Shield and Rack Guard. Since 1964, our company has grown and prospered due to its strong commitment to product development, quality control and, most importantly, meeting the needs of our customers. Husky Rack & Wire and its Velox Machine Guarding is one of the most innovative and affordable machine guarding systems on the market. Velox is the fastest-installing machine guarding system in the industry and creates a safe work environment by protecting both employees and equipment. Versatile and easily modifiable, Velox is designed to exceed regulatory safety requirements and install quickly, thus saving time, labor and cost. Please contact us for more information on our complete line of high quality material handling products.